A selection of product packaging from our early years. Talc Powder and 2 Rouge products in tins, cream rouge, left, and powder. This was the design of the 1920ies, typical Art Nouveau. 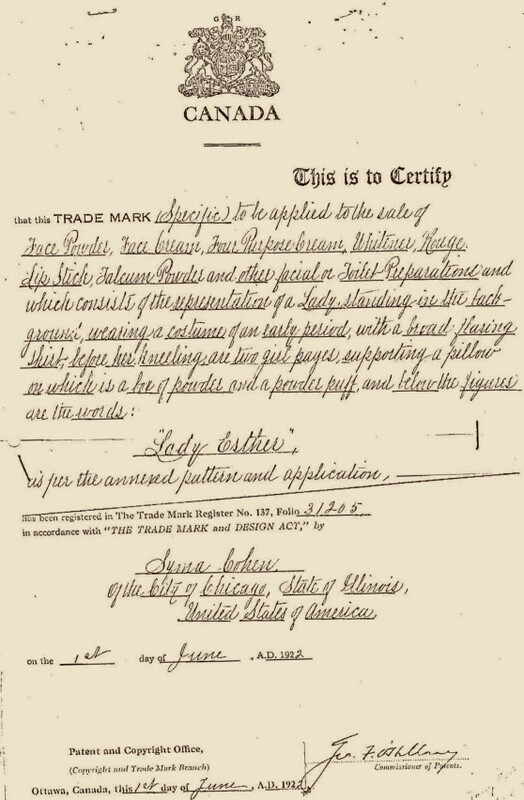 The trade mark is shown as described in the first application, 1913 in US and 1922 in Canada: “showing a Lady, wearing a costume of an early period” with two girl-pages “supporting a pillow on which is a box of powder”. The box on the left is stamped and made of heavy brass. It features a hinged lid and a mirror. The two other products are lithographed tins and much thinner. A loose talcum powder was still a standard cosmetic item in the 1920ies, all cosmetic manufacturers carried one in their range. 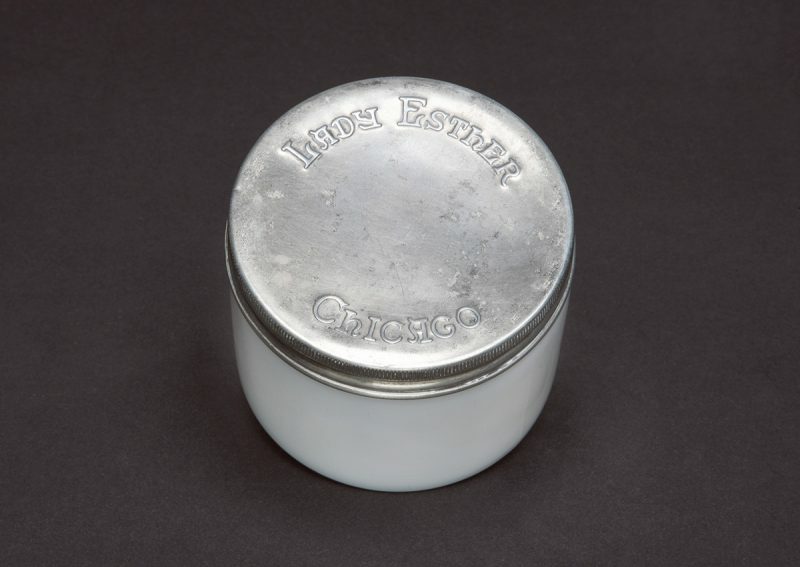 A quite heavy milk-glass jar with a stamped tin-lid. Approxymately 250ml. Originally it carried two red paper labels on the front and on the back, which showed the old label. There were different sizes for the Four Purpose Cream, this was the largest. This product was the foundation of the company’s success. This is a licensed product, imported from Paris and sold exclusively by Lady Esther in the US. The paper box shows a Lady in a Harlekin costume. 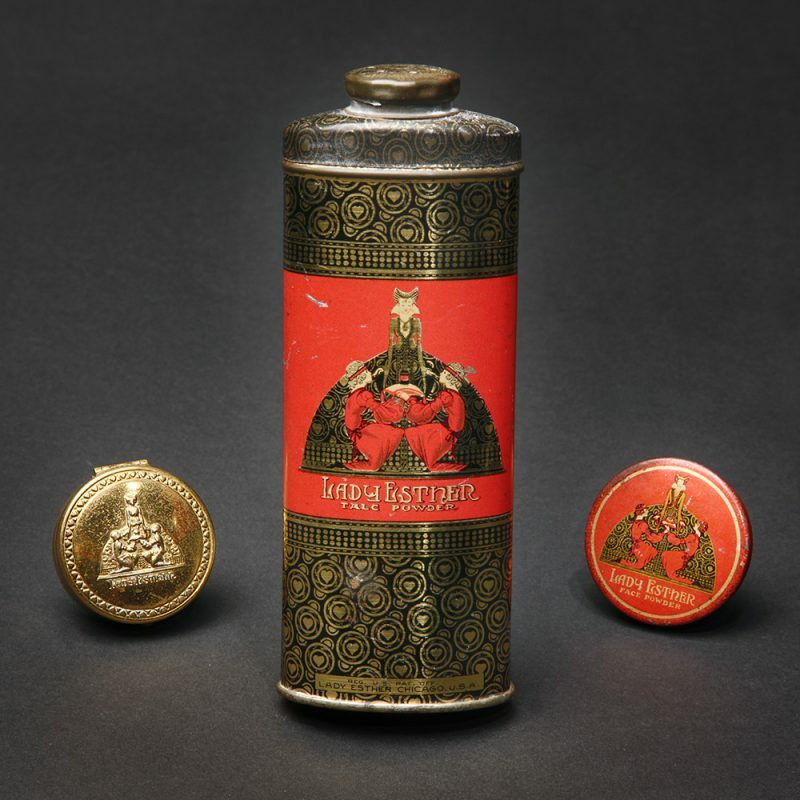 Syma Cohen referred to french face powder qualities still in her 1950ies advertisments, and how she had improved it with her formulae. 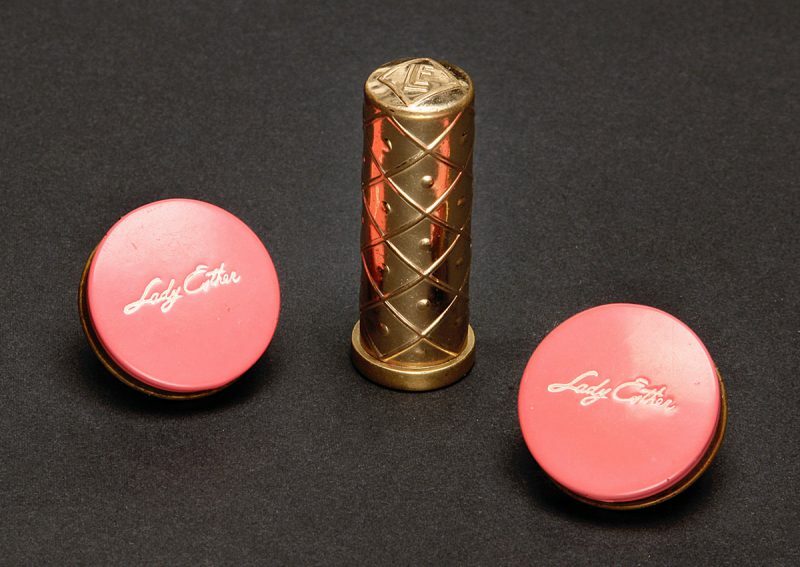 Lipstick with early swivel mechanism, a heavy brassed item. 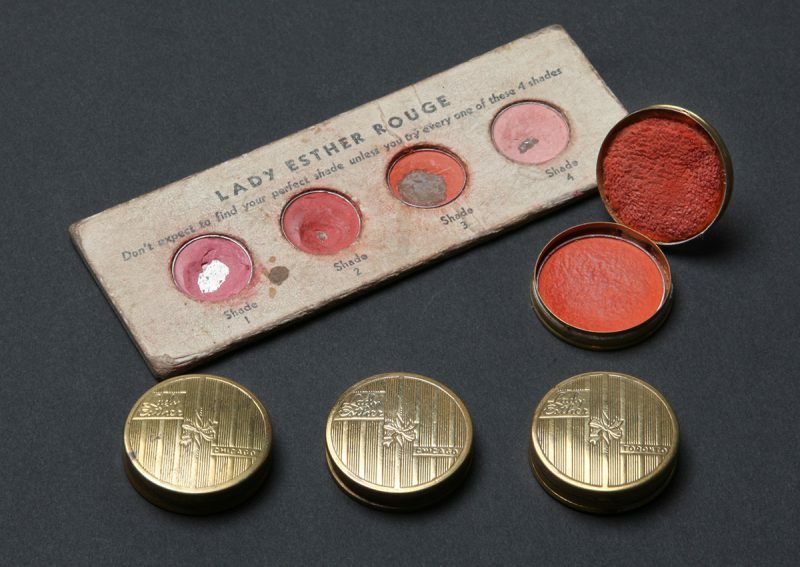 The painted rouge tins are also brassed and date into the 1940ies. 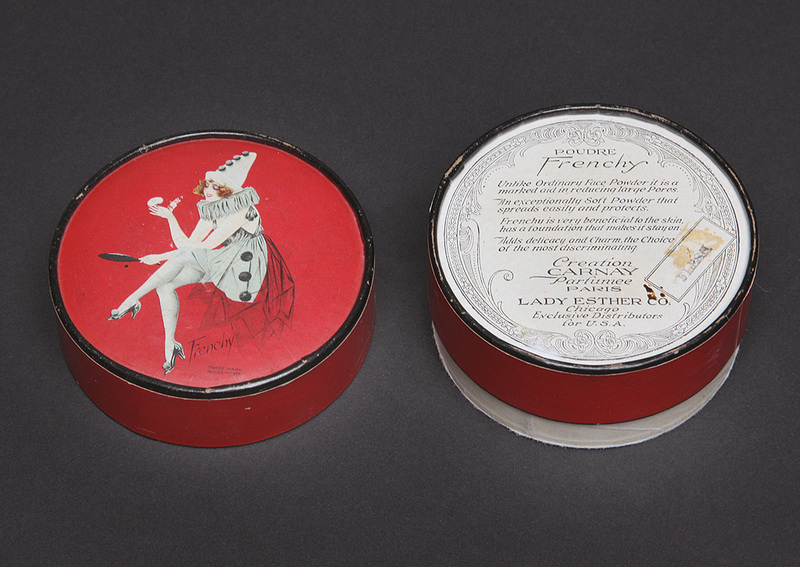 3 varieties made of carton.The octagonal box is from a very short-lived period, 1936. The blue box in the middle with its fan-motive was in production for over 20 years, until around 1954. To the right one of the first carton packages dating around 1932, with red corners and blue ribbon. This little tester set was actiually patented in the US! 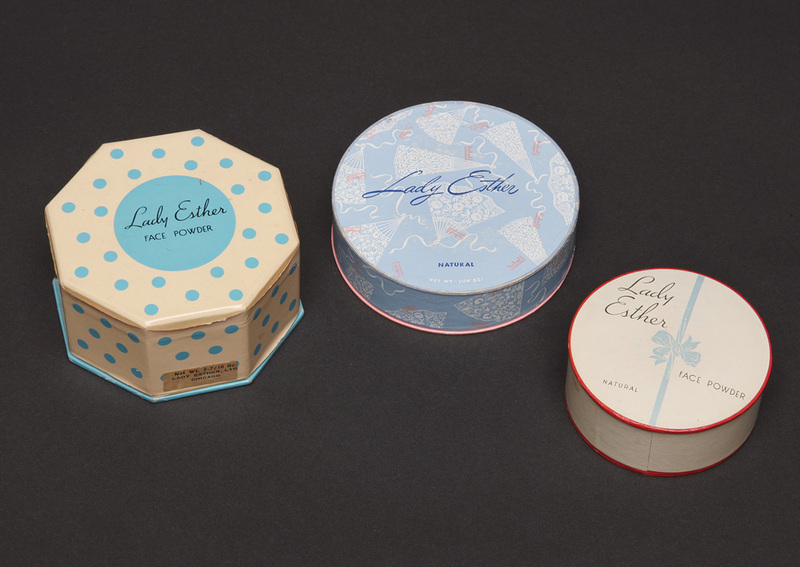 The brass boxes are about the size of a Dollar coin and they carry the ribbon pattern. There are two versions, stamped either Chicago or Toronto. 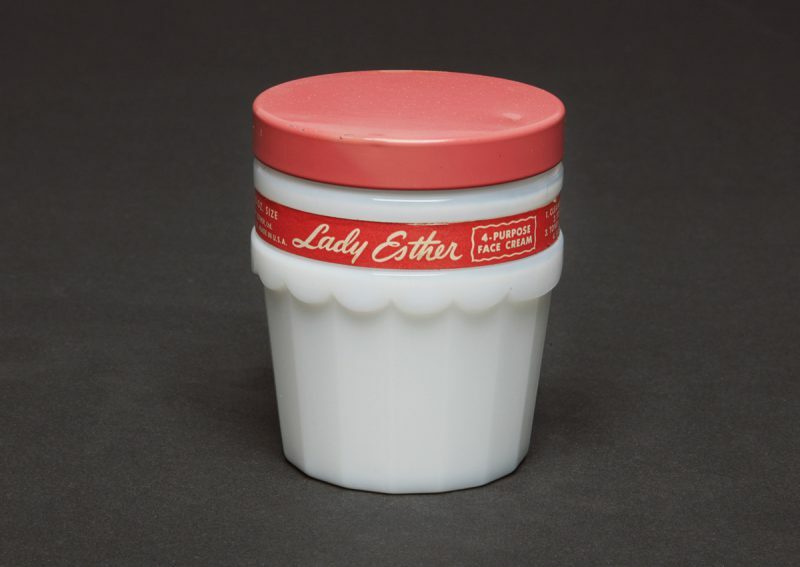 Lady Esther had their own production across the border in Canada, obviously for tax and duty reasons. A later version of the bestseller. This is the product which came off the production line as pictured on our history side.